It is no secret that when many kids head off to college, they realize how expensive food can be. Getting a decent meal in each day can be a struggle, and therefore many develop poor and unhealthy eating habits as a result. The good news is this doesn’t have to happen, and there are ways for college kids to save some cash while eating well. 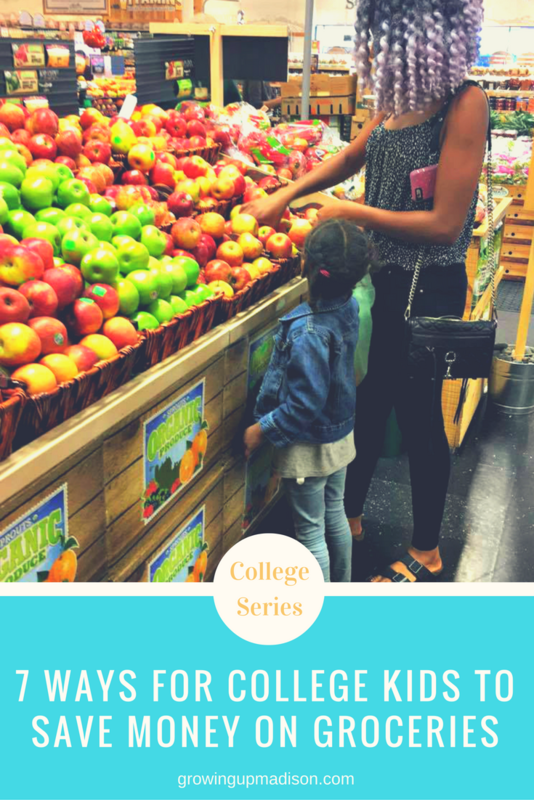 Take a look below at 7 ways for college kids to save money on groceries, so they can eat well while still having cash on hand for books, living expenses, and fun. 1. Teach them about in season produce. Give students a list of produce that is in by season. This way they know which produce items they should be looking for and when. Knowing the seasonal and sales cycles of fruit and vegetables can help them eat more fresh produce for less. You might have a college kid who loves name brands, but now is the time to get them to try new things. Stores such as Save-A-Lot offer their store brand for as much as 40% less than what your big box grocery stores charge. Encourage these stores so they can save as soon as they walk in. It is important for college kids to get their protein, but meat can be pricey. 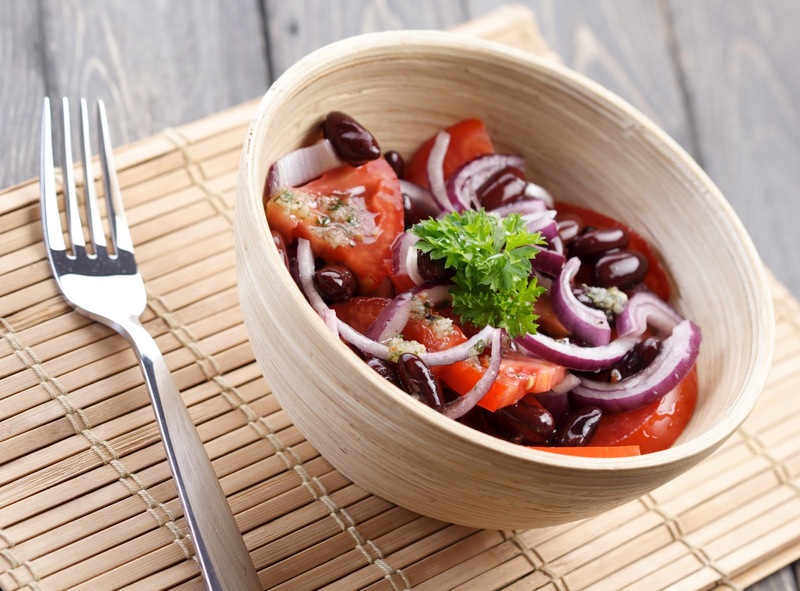 Instead explore some high protein, meatless recipes that will get the job done. There are many meatless soups and bean dishes they can try which are tasty and protein rich. Send kids to college with quality cookware so they can easily prep their own meals. Making a single investment in quality cookware that can last them all year will be so helpful, and allow them to buy fresh items and prep healthy meals instead of getting into the pricey carry out trap. Make sure your college student knows to grab a Sunday paper to clip out the food coupons that are available to them. It is worth the $1 investment to get $60+ in coupons and deals. They can also go to the websites of their favorite brands and see if coupons are available to print. 6. Find local farmer’s markets. 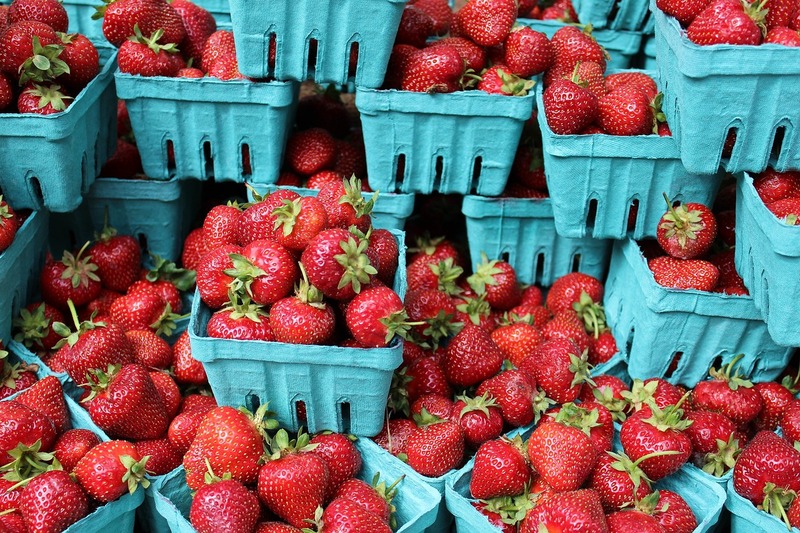 These markets can have great deals on fresh fruit, veggies, and bread. These are worth swinging into to find in season items at a great price and even get some recipe advice from the farmers. You never know what you will find! 7. Use that student status! Many eateries offer student discounts or they run a special night for students. Many shops and stores offer a student discount as well, as does Amazon Prime. If you have a valid student ID, don’t be afraid to use it so any valid discounts come your way. This is one of the easiest ways to save some cash and get some additional discounts. Pass these 7 ways for college kids to save money on groceries to a college student you know. You will be amazed at how much they can help, and this way they can eat well without going broke. Let's discuss: How do you save money on groceries? This is such a great post! I remember when I first went to college. Talk about a shock! I had no idea everything would cost so much! Yes the shock of attending college and having to pay for everything can be shocking. Excellent tips. Groceries can be one of the biggest expenses for college - for life in general, actually. This is going to be a big help for lots of people. Oh yes it can be! When you have a big family like mine, it can be even more so. These are all great tips. I always use coupons and I always look for the BOGO deals at our local store. Those deals are amazing and coupons can really save because they do add up. I recently graduated from college, and boy would it have been nice to know these tips! This is a seriously helpful post! Thank you Shelby and how was it when you were there? Did you use any of these tips to save? My friend is a college teacher and on one of the getting to know you quizzes found that most students stated that one of their main concerns was not having enough money to eat. These are all great ways to eat on a budget and I hope that many students can benefit from the tips! I love the idea of cooking more meatless meals. I do that with our big family and no one ever complains and it saves us a lot of money. Cutting back on meat does save money. I have 2 kids who don't like eating meat so sometimes I do meatless dishes and they love it. Oh definitely sticking to a list really does help. I've noticed that when I don't walk with a list, I always end up with stuff I don't even want. some fantastic tips and ideas, we are big fans of coupons and vouchers and meat can definitely be the most expensive part about meals. Bulking out with fruit, veg and seasonal produce is such a useful idea! Oh yes meat can be but eating seasonally sure does help. You're so right on about not realizing the costs of foods once you start buying your own. Love the idea of the local farmers markers! Fresh, local and within budget! Fresh, local and within budget is usually the way to go. Those are great tips, especially the in season produce! Otherwise you can really pay a fortune! Here we have Aldi that I like to visit for great prices. I've heard a lot about Aldi but unfortunately we don't have one here in my state. Coupons are a great way to save money, whether it's paper ones or store apps like Cartwheel, they are one of the easiest ways to save money. It is a great way to save money and I love the people who are great with coupons. Great ideas for regular "non students" too! Just wish I still had that student discount...lol. Student discounts does help doesn't it? I remember using it for everything. Now I use my military one. These are great, practical tips. Food prices are insane and it will come as a shock to most college students. Food prices can get insane and most college students don't realize that. I would like to use these ideas! Great ways to save for sure. Yes they are and thank you for stopping by. Wow! I actually learned from this and I'm no longer college student. LOL! I need to learn how to use coupons. Oh you and me both. I have seen couponers who do their entire shopping by using coupons, wish I could do that! I use coupons whenever possible. These are great tips not just for students, but for mms like me as well. I try to use them whenever I can myself, they do help. I eat a lot of vegan food, so it isn't often that the brands I buy from offer coupons. However, I do advantage of coupons and sales whenever I can! We eat a lot more organic produce as well and I've also noticed that my brands don't usually give coupons either. Bummer! That photo makes my mouth water! Do you have a recipe? Great tips, especially the in-season trick. I have trouble with that one because I want my favorite fruits all year-long, but the prices can vary so much and then I end up paying more for fruits that are smaller than I'd like. I actually do not but you can make your own summer/fall or whatever season you're in salad. Great tips!! I grew up clipping coupons and while in college I met my coupon soul mate. We were always so excited to share coupons and find deals! Oh that sounds delightful! I need to get better with couponing. I think the idea of meatless meals is a great tip. It is not only cost effective, but healthy as well. It is healthy, and also a lot more affordable as well. I wish I still had a student discount to use! It's such a great way to save some money on fresh produce. Now I use our farmer's market. Farmers Market are the way to go! All great tips! I graduated from college about 4 years ago and I definitely relate to this struggle. Especially living on campus I found it very difficult to eat healthy and save money, so I resorted to the cheaper, unhealthy foods. Even know post college life I still use ideas like this to save money on groceries! That is great! I have a daughter in college right now who uses these tips. I lived in a college town for many, many years. There were so many programs for the students to get discounts. I know many appreciate that. I'm sure they do, especially since for most it's the first time living on their own and it can be expensive. This is a good-looking reference list; I like some of the pointers you mention, such as utilizing your student ID for discounts. Yogurt is another cheap protein source. Yogurt sure is, and you should use your student discount if you can. I'm glad I was able to share some with you. Using the student status is smart! I've done that often because every little bit helps! Every little bit sure does help! I love the meatless menu ideas. I told my cousin the same thing when he went off to college. He also did meals throughout the week that you could share ingredients for. It helped a lot. That's a great idea. When you have ingredients that can do a variety of meals, those are the best! Please share it with her. She'll appreciate it. The ramen and peanut butter sandwiches don't have to be part of the college experience. Glad there are ways for college students to eat well without spending a ton of money. Most college students tend to eat that way, but they don't really if they budget. These are all great options for students. As a college student myself, it definitely helps to use your student discount! So many places offer it that it is silly to pass it up! It really is. I remember that I used to ask every place I went to if they offered one and they usually did. It is important to give them the foundation to want to eat right, and then set them up so they can when they're gone. These tips are all great. I love the idea of sending quality cookware along with them. If they have it, they definitely might be more prone to cooking in than if they didn't. That is very true. My daughter got her first apartment a few months ago and I went shopping with her and got her a few things so she can eat home more and out less. These are really great tips we can all use! I find that the farmer’s market usually has better deals on produce as well! I especially like the idea of buying what is in season. Too often I forget that. I think most people do. I myself am guilty of that at times. These are all great tips, especially utilizing the Farmer's markets and having meatless meals. When I shop at the markets I tend to get better deals and I know where my food is coming from. Win-win, but really, using those coupons at stores like Save-a-lot and really watching the circular is where I am able to save a lot of money. That is awesome! I like Save-a-Lot myself too! These are great tips! My son will be starting college in a couple months and needs to know how to save. Yes he's going to need to know how to save for sure! These are incredible tips! I just graduated from college and grocery shopping was SO expensive, but avoiding it meant having to eat out or eat unhealthily, so it always felt like a lose/lose. Wish I had these tips back then! Well you have the tips now, and better late than never!